Join us from 2-7pm Sunday, July 26 for an in-depth profile of guitarist Lloyd “Tiny” Grimes. 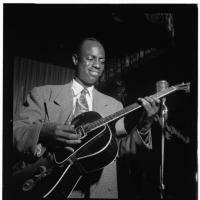 Heavily influenced by Charlie Christian, Grimes played the electric guitar -- both the four-string (tenor) and six-string models -- in Christian’s characteristic swing-to-bop style. Grimes picked up the electric guitar in 1938, following stints as a drummer, pianist, and vocalist. After debuting with harmony vocal group the Cats and a Fiddle, Grimes formed a trio with Art Tatum and Slam Stewart. He would perform as part of the Art Tatum Trio from 1943-4. Throughout the late 1940s and early 1950s, Grimes played with artists including Charlie Parker, Screamin’ Jay Hawkins, and Billie Holiday. As a bandleader, Grimes notably recorded with the R&B-oriented group The Rockin’ Highlanders from 1948-1952. Later in his career, Grimes recorded with Roy Eldridge and Lloyd Glenn. He continued to play and perform until his death in 1989.